Since rejoining the SCGA in 2015, Wil has been responsible for the successful launch of SCGA Golf Leagues, a program designed to serve as a key benefit for SCGA members, potential members and golf facilities. Wil has also supported the department’s expanded programming by overseeing all interclub competitions, which include Team Play, Women’s Team Play, as well as championships designed to promote participation and competition at the member club level (such as the SCGA Tournament of Club Champions). 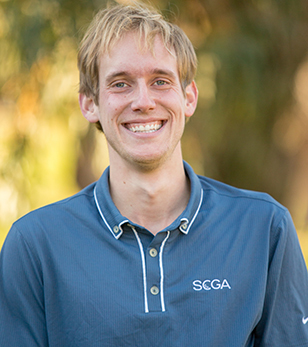 In addition to serving as the staff in charge of numerous qualifiers and championships throughout Southern California, Wil is also the point of contact for the SCGA Scratch League. Born and raised in Marshall, Michigan, Wil graduated from the University of Michigan in December of 2011 with a degree in Sport Management. While at Michigan, he spent four years working for the Michigan Football program, as well as a summer working for the Kansas City Royals. "I like getting out and visiting courses and clubs across Southern California. I am still pretty new to the state, so just about every time I am on the road it is a new experience for me." Contact Wil Mayo at: wmayo@scga.org .